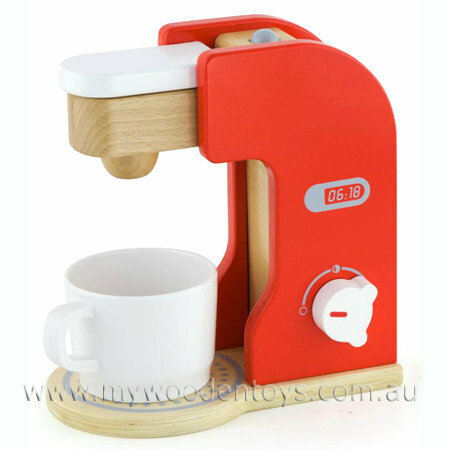 Wooden Toy Coffee Maker is a beautifully made wooden kitchen toy that allows your little one to brew an imaginary mug of coffee. This toy comes with a plastic mug and a removable disk / coffee pod which slots into the top, just like the real thing. The knob on the Coffee Makers side turns and makes a very satisfying "clak clak" sound. The disk / pod is inserted after you open the little hatch on the top / front of the machine. There is also a push button on the top to start the pretend brewing process. Material: Wood, Child-safe paint, varnish, Plastic Mug. We like this because: "A wonderful pretend play toy."